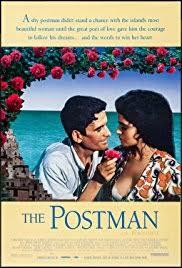 Review: Mario, a postman learns to love poetry while delivering mail to a famous poet named Neruda. Mario with his poetry and the help from from Neruda helps him win over the captivating local beauty Beatrice. The screenplay is based on a novel called Burning Patience, by Antonio Skarmeta. This is a remake of a 1983 film named Ardiente Paciencia. The only thing that they have changed for this film is the time and place. Instead this is Italy in the 1950’s. Wonderful performances by the two main actors Massimo Troisi and Philippe Noiret. Philippe Noiret was in the amazing Cinema Paradiso, 1988. Sadly Massimo Troisi was fated never to know that Il Postino would receive worldwide acclaim. He passed away after suffering from a heart ailment and was unable to work more than an hour or two each day. He died in his sleep at the age of 41, the day after shooting ended on the film. The scenery is breathtakingly beautiful and also understated direction from Michael Radford. This is a timeless classic that will never be forgotten. This is the last film that was rated ‘U’ to be nominated for the best picture Oscar. At the Academy Awards in 1996 this won 1 Oscar and that was for Best Music, Original Dramatic Score (Luis Bacalov). At the Bafta Awards in 1996 this won 3 awards. They were for Luis Bacalov for the Anthony Asquith Award for Film Music, Best Film not in the English Language and also Michael Radford got the David Lean Award for Direction.